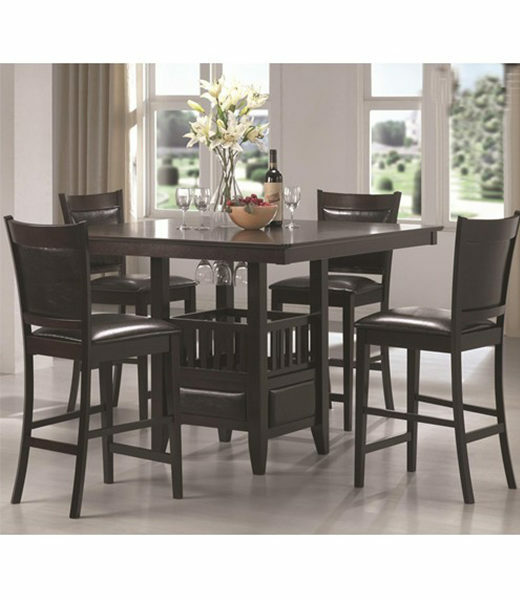 Dine in casual comfort with the five-piece Jaden Counter Height Table & Stool set. Square in shape, the counter height pub table is crafted from select hardwoods and okume veneers with a rich cappuccino finish. 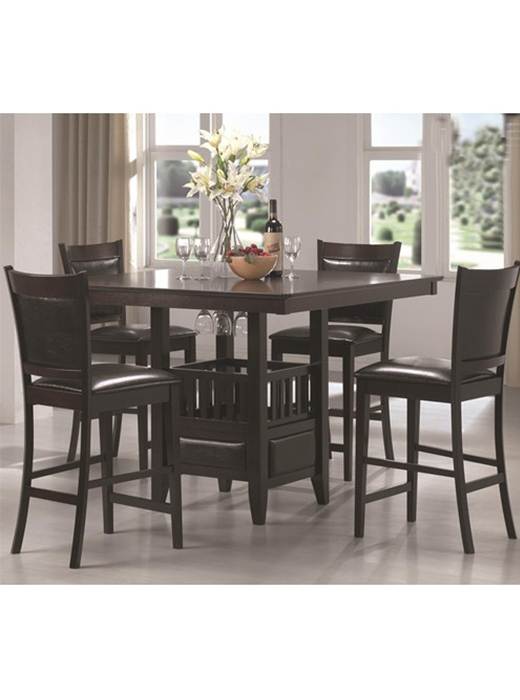 Dine in casual comfort with the five-piece Jaden Counter Height Table & Stool set. Square in shape, the counter height pub table is crafted from select hardwoods and okume veneers with a rich cappuccino finish. A square storage table base includes a center storage cabinet with wine glass holders, allowing you to make the most of your dining space. Vinyl padding on the storage cabinet’s sides adds a visual detail to impress. Accompanied are four counter stools with beautiful black upholstered seats and backs. Wrapped in a leather-like vinyl, these chairs have an upscale look and feel that does not sacrifice durability and comfort. Support stretchers provide sound structure and visual details to impress. Modern with a simple yet stylish design, this table is appropriate for both formal or casual dining environments. Complete your home with the Jaden Pub Table & Chair set.